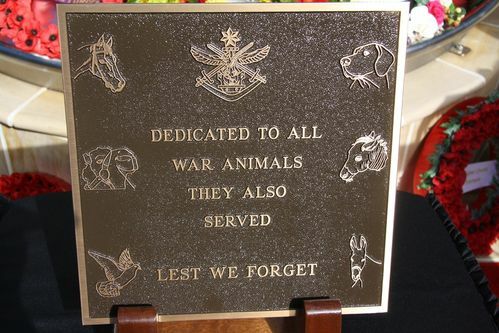 A plaque is dedicated to all animals who have served our nation in times of war and peace. The plaque recognises the sacrifices and deeds that animals have undertaken in battlefields around the world. Senior Constable Nigel Allsopp, a current-serving police-dog handler and President of the Australian War Animal Memorial Organization, was a driving force behind the war-animal memorial dedication.